Your generosity can make a big difference to Ohio State. Whether you want to see your impact firsthand or ensure support after your lifetime, we can help devise a plan. The Neil Legacy Society, named for the Neil family who gave 361 acres of farmland for what is now known as The Ohio State University, honors suporters who name us in their estate plans. Meet other supporters who have made an impact through their giving. 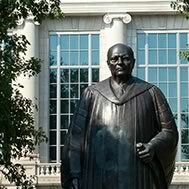 Their gifts help our students and faculty sustain The Ohio State University's world-class reputation.